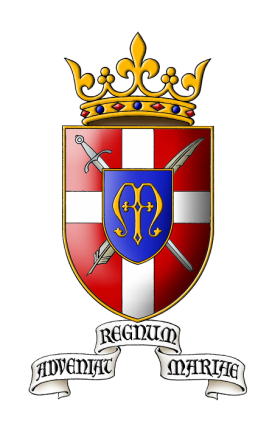 The Academy’s main patron is the great Marian apostle, St. Louis-Marie Grignion de Montfort. A deep, Catholic upbringing and the formation of Catholic gentleman call for an ardent devotion to the Blessed Mother. Inspired by St. Louis de Montfort’s treatise True Devotion to Mary, the Academy sees the most perfect and effective means of serving God, the Church and Christian civilization is through a slavery of love to the Queen of Heaven. Fire has many characteristics that are very familiar. It illuminates, heats, and consumes. Yet, since every creature of God is a tangible symbol of some virtue or defect, fire must have some metaphorical characteristic. Looking at it historically, one can realize that is a symbol of holocaust, or of sacrifice. It is because of this that God wanted the Jews of the Old Testament to burn their offerings. 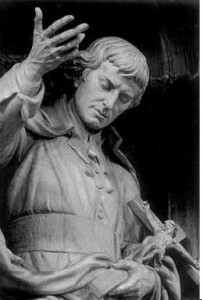 In the life of Saint Louis Marie Grignion de Montfort, one sees that he was a man all ablaze with zeal for the glory of God and His Blessed Mother. Just as fire brings light to material things, so did Saint Louis bring the light of his teaching to countless souls in France. During a time when devotion to Our Blessed Mother was not well practiced, he saw that he had the mission to be an apostle of Mary, to guide souls to Jesus through Mary. He went about the regions of Brittany and the Vendée as a missionary, preaching this most perfect and efficacious means to go to Our Lord. He taught that if one does not go through Our Lady to Our Lord, it is like relying on an imperfect sculptor who can make mistakes in forming one’s soul. Yet, if one goes through Our Lady and consecrates herself as a slave of love, one is cast in the perfect mold of Our Lord. She will guide us and form us without error because she is most perfectly united to her Divine Son. Saint Louis also taught that she is that most kind Queen Mother through whom a humble sinner can obtain favors and graces from the King, her Divine Son. Thus Saint Louis especially spread this precious devotion to Our Lady like a light in the darkness of a France on the verge of the French Revolution. Often, light can illuminate, but it does not always give warmth and heat. Likewise Saint Louis’ teachings may have enlightened many a soul, but if he did not give the warmth of example, he would not have profoundly moved many. He was a man of strong conviction who did not tolerate any offense against God or His Blessed Mother. On one occasion, for example, he was walking through the streets of a town when his attention was caught by a singer who was singing a licentious song and selling the music to his indecent song. Saint Louis would not let this offense pass; he took the music sheets and tore them up in the face of the singer. Another time, when Saint Louis was preaching in a church, a nearby tavern was erupting in a disrespectful ruckus. Saint Louis, not tolerating this offense, went over and told the drunkards that it would be better that they never return there. Fists began to fly, yet Saint Louis came out victorious. The acceptance of upright and true doctrine is good, but is feeble if one shrinks away from defending them. When a fire burns in a hearth, the wood that is burnt is reduced to ashes, to nothing. One could say that the wood itself gives itself up in order to provide light and heat. This metaphor can be applied to the sufferings and hardships Saint Louis bore in addition to the great physical and spiritual exertions of his missionary work. Saint Louis encountered much opposition throughout his lifetime, even from his ecclesiastical superiors. The influence of Jansenism had taken its toll even among high ecclesiastics and Saint Louis’ missionary work was a boulder that opposed the current. Sometimes, bishops would banish him from their dioceses or refuse him permission to say Mass. He was despised and rejected but, like Our Lord, he suffered without complaint. He had the true spirit of the cross of Christ that does not cower from suffering, but, rather, endures it heroically, offering up trials for holocausts. The comparison of Saint Louis de Montfort’s life to fire is incomplete in one sense. After a fire has burned out, it simply ceases to exist. However, when a man’s whole life is consumed by the fire of his dedication and zeal, his body may deteriorate, but his soul is enriched, fortified, and made perfect. Now his soul burns with the most intense love before the King and Queen of Heaven, They whom he served so zealously on earth.